… and Drive-In, too! Classic cars on display, free Young Eagles airplane rides for children ages 8-17, silent auction, food, flight simulator, and more! Pecan Plantation Airpark (0TX1). You can expect to get a close-up and personal look at dozens of unique aircraft and have a really big time at our Annual EAA Chapter 983 Fly-In. We will have plenty of food, a silent auction, fun and games for the kids, and more. Our Young Eagles Flight Experience and Eagle Flights programs will be in full swing, offering you aspiring aviators and enthusiasts a first-hand opportunity to discover what flying is really all about. PILOTS: Be sure to review AirNav and other official sources! 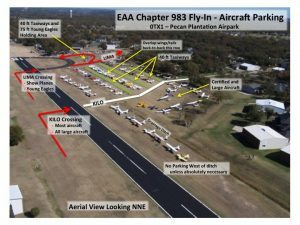 And review our Fly-In PILOT BRIEFING for aircraft parking and other procedures. Click the image to enlarge an aerial view of the aircraft parking area. Also, be aware that our Air Boss may ask for crossings/taxi back different than outlined on the Pilot Briefing to allow for aircraft requesting to land on the grass (e.g., Stearman). RY19 – Right traffic. Busy road on short final – avoid being too low. After landing, plan to exit to the west side, right onto the grass and taxi north. RY01 – Left traffic. A strong downdraft may be experienced on short final, especially when the winds are from the north to west. After landing, plan for an expedient taxi to the north end, or exit to the west side, left onto the grass. There is a fairly significant lip in some locations which may damage low wheel pants when exiting or entering the runway from the west side grass. If this is a concern, watch for one of four paved entry/exit “ramps” between the runway and grass. Use extreme caution, especially in the vicinity of the aircraft parking areas. There will be both children and adults who may not be familiar with aircraft operations. Watch for and follow instructions from our parking marshals. Do not restart for departure without first contacting someone to help guide you out.